Each year, Americans observe National Hispanic Heritage Month from September 15th to October 15th, by celebrating the histories, cultures and contributions of American citizens whose ancestors came from Spain, Mexico, the Caribbean and Central and South America. Altura embraces the diversity and opportunity to be a part of the communities we serve by celebrating Hispanic Heritage Month. 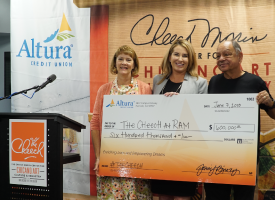 Recently, Altura continued our support for causes important to our Hispanic Members and all of our Members through our $600,000 donation to the Cheech Marin Center for Chicano Art, Culture & Industry.